As I suspected, I’m already falling behind in updating this now that my “vacation” is over. I’ve done a little baking, but between being sick (stupid summer colds!) working two jobs, running – or helping to run – a few worship services, and trying to gear up for a summer intensive class I haven’t had the time to really experiment or try anything awesome. I did make some brownies the other day, using Bob’s Red Mill Brownie mix, and adding some butterscotch chips (I must use them!!) and some strawberry juice (directly pressed out of some strawberries). They turned out pretty yummy I think. But there is one issue I keep encountering – I put the brownies in the pan as directed (even got the correct size pan in hopes that it would make them turn out correctly! ), I cook them in a preheated oven, at the prescribed temperature, for the prescribed time… and they remain liquid in the center. I cook them longer and still, liquid. Even longer and I managed to get them less liquid, but they are still very gooey. Suggestions? Just across the street. 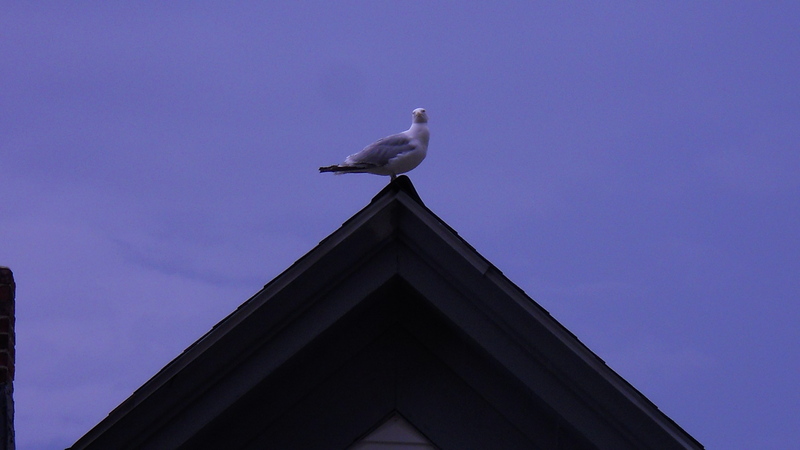 The birds enjoy perching on the peak of that house. 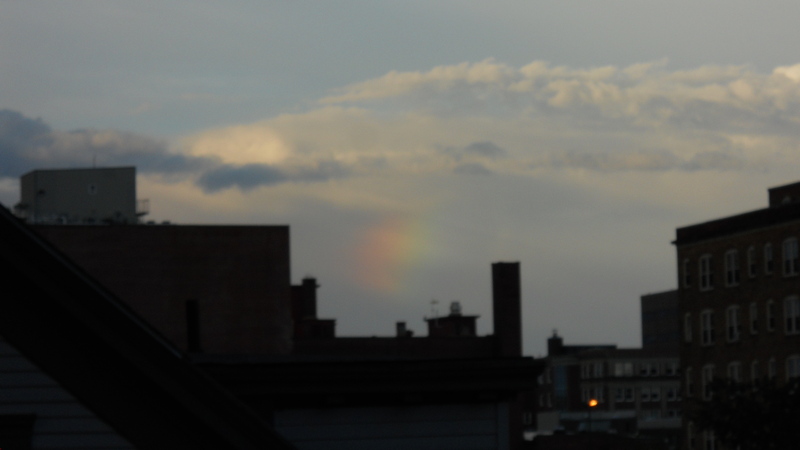 Rainbow Smudge - we've had some storms and this little bit of a rainbow showed through one day. Didn't manage to get a picture of the full rainbow we got a few days later, though. It was my roomies birthday, so we, of course, had to have some cake. Since I’m Gluten-Free, I wanted something I could enjoy as well… and I happened to have some Bob’s Red Mill Chocolate Cake Mix kicking about in the pantry, so I thought I’d give it a shot. Can’t quite beat the heat, but at least you can have something cool to drink! We’ve had a few hot days in Maine this summer. 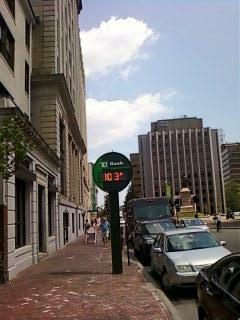 Not as hot as some places in the country, but still, hotter (and more humid) than I care for! This sign tends to run closer to what I think must be the "feels like" temp... still... way too hot for me! I found myself really wanting some strawberry lemonade, something refreshing, cool, and a bit sweet. And I have all these strawberries, that I’ve only used a little of, which still need to be put to use. They’ve been taking up too much space in my freezer. Adventures in Camping, Part 3. I had my own moose encounter on the Sandy Stream Trail. I decided to go out for a walk on my own during our second day, wanting to take some time to sit out on the Big Rock viewpoint and do some thinking and writing. 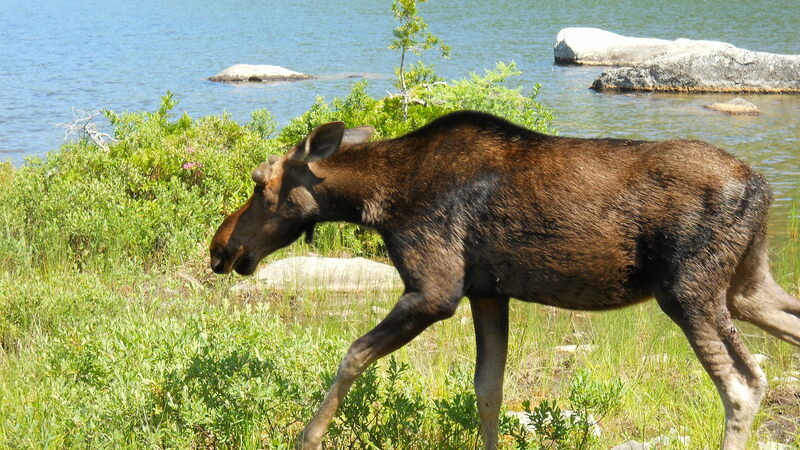 I stopped at the first viewpoint to see if there were any moose out in the pond – they love the water there and it’s a popular place to see moose. 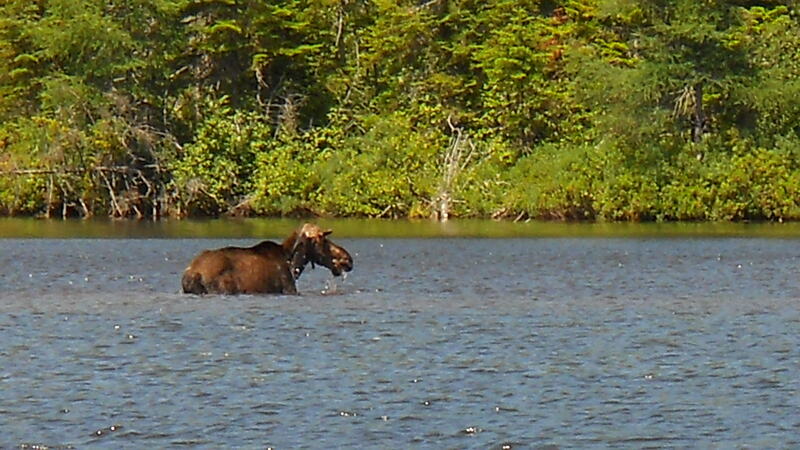 On our first night we saw a bull moose out across the water and so I had hope that I could see another one. 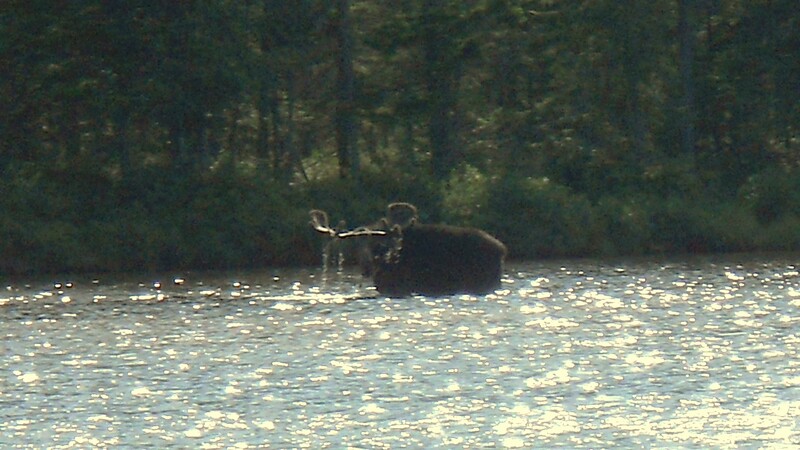 Bull Moose from the first night – yay for the zoom on my camera. Katahdin from one of the viewpoints at Sandy Stream Pond. 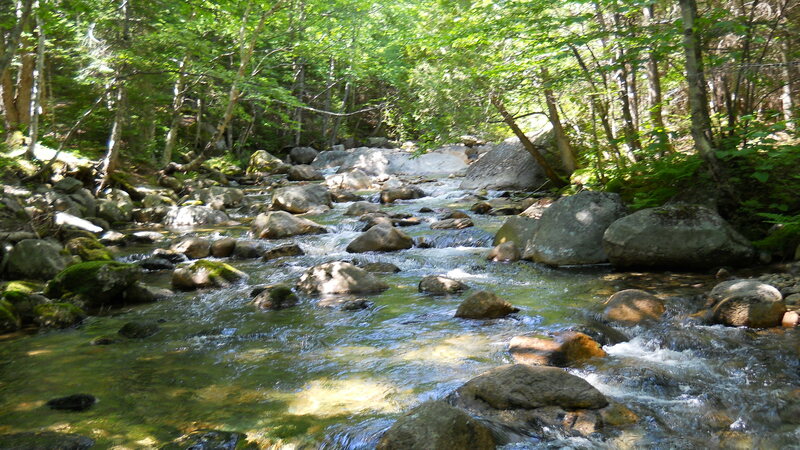 I just got back from a camping trip up at Baxter State park here in Maine. 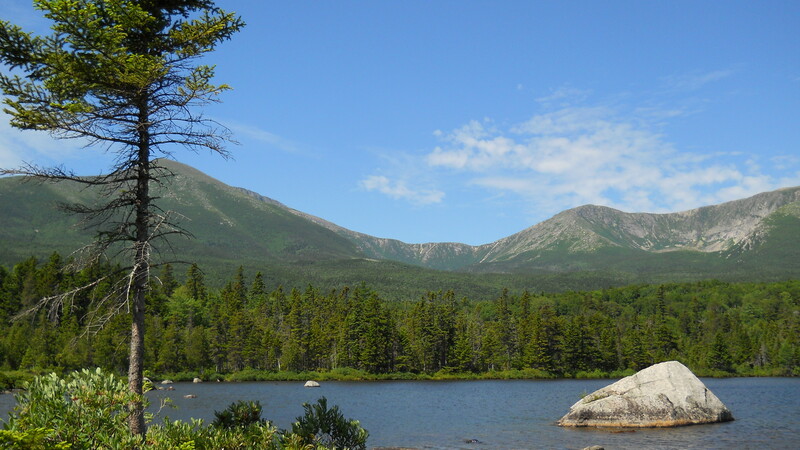 It’s beautiful there, Katahdin is a gorgeous mountain, rising up from the area around it, and I always love my visits here. This is my third summer spending a long weekend at the park, going up with some friends who have been camping at Baxter for years. We were only there for two nights, but I have a lot to say – so prepare for a few entries (hopefully more than one a week) while I get it all out! I have a lot of reflecting to do, plus, I have lots of pictures to share! I am finding my way on the meandering, twisting path of life, constantly surprised by what’s around the next bend. Working to embrace and face the challenges inherent with following your dreams, and writing the journey. A writer and dreamer, historian and theologian, academic and fantasy-world-creator, genealogist and gluten-free baker, crafter and reader, poet and life-long learner, constantly questioning and occasionally irreverent. #littlefreelibrary will be getting an upgrade soon!! Helped Mom with a tea this morning. Now to rest!! All writing and photographs on this page are the work of Allison Gammons, unless otherwise noted. Please, if you are going to share my work anywhere, be sure to properly attribute the work, and link back to my blog! Thanks!